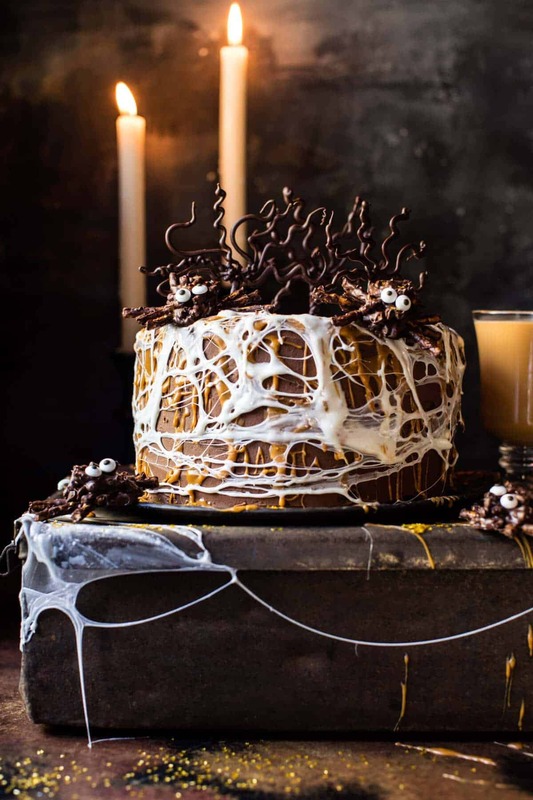 Forbidden Forest Chocolate Butterbeer Cake. This cake! Oh my gosh!! Where do I begin? Well, for one, I think it’s no secret around here that I am both Harry Potter and Halloween obsessed, so you guys had to have an idea that Halloween inspired treats were coming. Every October I have way too much fun baking up spooky Halloween goodies. I’ve never really gotten into making spooky dinner type food because, to be completely honest, eyeballs in my pasta just weirds me out too much. SO I’ll just stick to making creepy cheese boards, desserts and fun drinks! 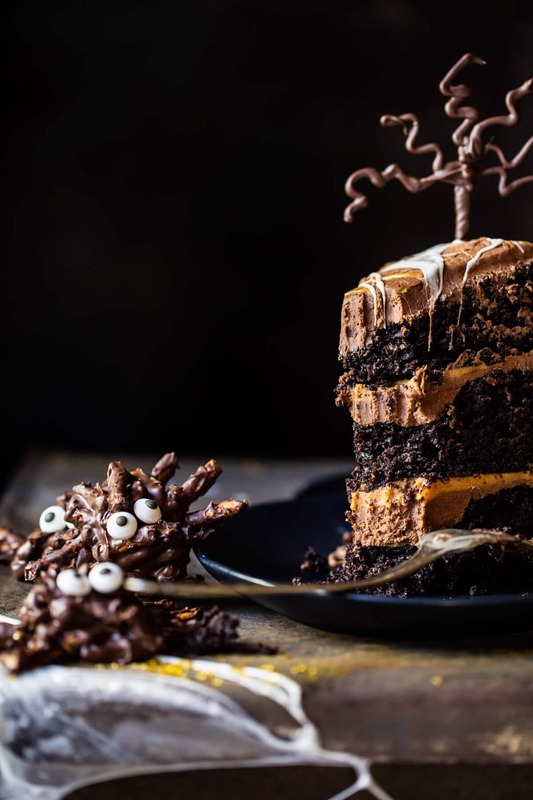 This forbidden forest chocolate butterbeer cake is just the beginning of the Halloween treats to come, but I have to say, it will probably be my favorite for the month. I mean, just look at this cake! I get excited just thinking about its butterbeer insides and all of its chocolately goodness… it. is. the. BEST! I know some of you might be thinking that after spending three days at the Wizarding World of Harry Potter this last week that I came right home and made this cake. Nope, I’ve actually been dreaming about this cake since August. Yes, like for real. I think about holidays way too far in advance, but I mean, I love it, so whatever. Anyway, I’ve been planning this cake for the longest time and when I finally made it the other week, I was pretty ecstatic with how it turned out. Sometimes I can have these grand pictures of how recipes should look in my head and then they just kind of fall flat. But this cake actually turned out better than the picture in my head and it tastes far better than it looks. <–truth. 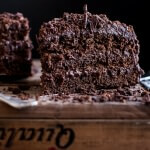 Sooo, everything starts out with my favorite chocolate cake recipe. I did a three layer cake because I figured, it’s Halloween and I mean, why the heck not?! Next we move onto the frosting. This frosting is everything, it’s chocolate butterbeer and it is addicting. Think whipped chocolate buttercream with the addition of rich butterbeer sauce…aka butterscotch sauce. It’s simple, perfect and well, I could totally just eat it with a spoon and be happy. YUM. Ok, but it doesn’t end there. 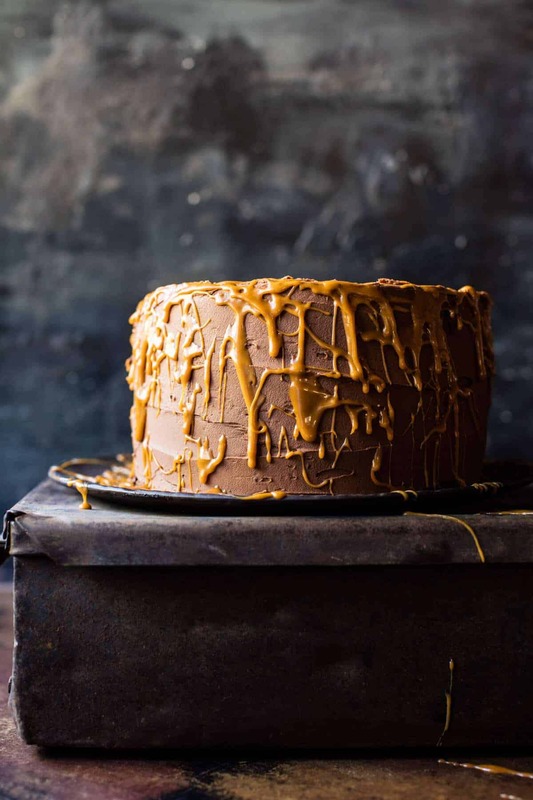 After you layer the cakes with frosting, you then add a generous drizzle of butterbeer sauce. Once the cake is all frosted and looking good, then comes the super fun part… you ready? A marshmallow spider wed. Um, yes. I first learned of this idea here, and the second I saw it, I knew it had to be part of my butterbeer cake. Then I could call my cake the Forbidden Forest Cake and add black spiders. If you guys know anything about Harry Potter than you know that the Forbidden Forest is full of black spiders, so it makes sense if you’re a Harry Potter freak like me. 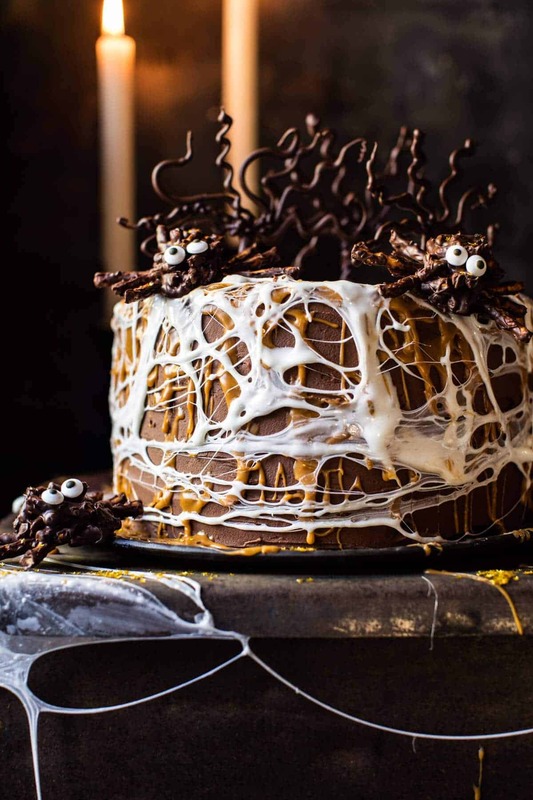 If you’re not, just think of this cake as a cute Halloween Spider Web Cake. Either way, the cake is going to be fun, cute and just plain awesome. Ahh, but wait, there’s still more, I know, I know! So once you add the marshmallow spider web, you need to make the chocolate pretzels spiders and the weeping willow chocolate trees. Both are cute and kind of DELISH. I mean, chocolate + peanut butter + pretzels? Yup, I’m totally down with that! Now, I know this cake sounds like a lot of work, and I’m not going to sit here and tell you that it can be made in thirty minutes, because it can’t, BUT what I will say is that this cake is a really fun one to make, and while it has a few components to it, none of them are hard or extremely time-consuming. 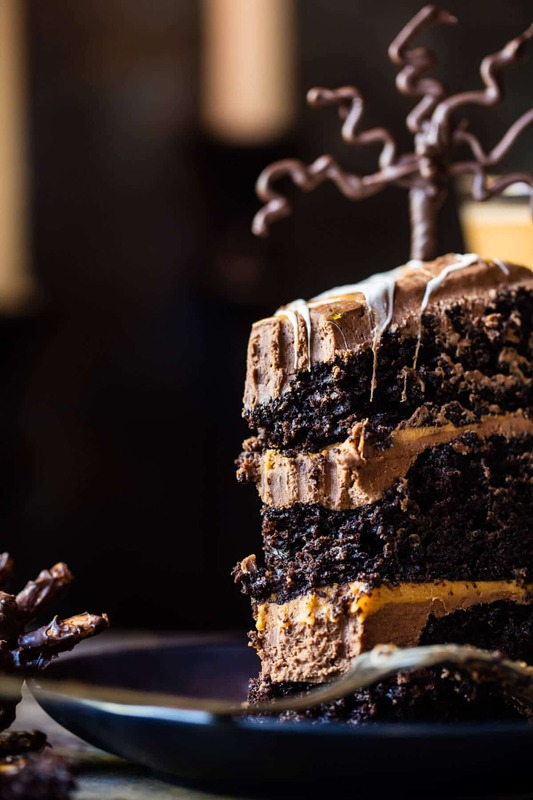 AND the best part about this cake is that it’s meant to be a Halloween Cake. Meaning perfection is not what we are going for. Creepy one-legged spiders will work, and crooked trees are totally what we are going for here! Also, after trying the butterbeer at Harry Potter, I can now officially say that this cake has legit “butterbeer flavors”. Not going to lie, the butterbeer drink itself was way too intense for me. Meaning, way too much sugar in a cup. It was delish, but I was done after a couple sips. Whoa sugar rush! And done… Happy Friday everyone!! Hope your weekend is filled with October things like picking apples, hunting for perfect pumpkins and baking butterbeer cakes! Forbidden Forrest Butterbeer Chocolate Cake. Preheat the oven to 350 degrees F. Grease three 8-inch round cake pans. Line with parchment paper, then butter/spray with cooking spray. In a medium bowl combine the flour, sugar, unsweetened cocoa powder, baking soda, baking powder and salt. In the bowl of a stand mixer (or use a hand held mixer) beat together the eggs, buttermilk, greek yogurt, canola oil and vanilla until smooth. Slowly add the dry ingredients to the wet ingredients with the mixer on low until there are no longer any clumps of flour. Add the cream soda (or ginger beer) and mix until combined. The batter should be pourable, but not super thin. Divide the batter evenly among the 3 cake pans. Transfer to the oven and bake 20 to 25 minutes, until the tops are just set and no longer wiggly in the center. Remove and let cool five minutes, then run a knife around the edges of the pan. Grab 3 large flat plates, line them with wax or parchment paper and invert the cakes onto the paper lined plates. Cover and let the cakes cool completely before frosting. To make the frosting. Add the butterscotch chips and cream to a small saucepan. Set over low heat, stirring often until melted and smooth. Remove from the heat. Set the butterbeer sauce aside. Add the butter and powdered sugar to the bowl of a stand mixer (or use a hand held mixer). Beat the butter, peanut butter and powdered sugar together until the butter is light and fluffy, about 4 minutes. Add the cocoa powder and vanilla and beat, scraping down the sides as needed another 2 minutes or until there are no streaks of white. Add 1/2 cup of the butterbeer sauce and whip the frosting for 2-4 minutes or until light and fluffy. To assemble the cake. Place 1 cake layer, flat side up, on a plate or cake stand. With a knife or offset spatula, spread the top with frosting. Drizzle with 2-4 tablespoons butterbeer sauce. Place the second layer on top, rounded side up, and spread the frosting. Drizzle with 2-4 tablespoons butterbeer sauce. Add on the final layer, rounded side up, and top with the remaining frosting, evenly spreading on the top and sides of the cake. Drizzle the cake all over with the remaining butterbeer sauce. To make the web: Melt the marshmallows in the microwave on 30 second intervals, stirring after each, until melted and smooth. Let cool 3-5 minutes and then use your hands to stretch/pull the melted marshmallow around the cake to create a spider web. Go in as many directions as possible. It will be messy, but fun! Cake should be kept in an airtight container in a cool, dry place or in the fridge. To make the spiders. Melt together the chocolate chips and peanut butter in the microwave or over a double broiler. Stir in the crushed pretzel sticks. Mound the pretzels into tablespoon size balls and place on a parchment or wax lined baking sheet. Take the remaining pretzels and toss them through the melted chocolate. Attach 3 pretzel legs on either side of the pretzel balls and then add 2 candy eyes to create eyes for the spiders. Place in the freezer to harden for 5-10 minutes. To create the chocolate trees, melt 8 ounces semi-sweet chocolate and let cool 5 minutes. Transfer the chocolate to a ziplock bag and snip a small portion of the corner off the bag. On a parchment lined baking sheet, pipe out skinny leafless trees. Place in the freezer to harden for 5-10 minutes. Just before serving the cake, stick the trees around the top of the cake and decorate with chocolate spiders. Serve the cake at room temperature. And then proceeding to eat ALL the cake…cause I mean, do you see that piece? NEED IT. Thanks so much Julie! So happy you love this!! This cake is really fun looking, I loved it!! This is a fun cake!! This cake is GORGEOUS, Tieghan! That marshmallow fluff web is simply brilliant – and, speaking of brilliant, wow – that whipped butterbeer frosting – intoxicatingly decadent! Blown away! Awh thanks so much Shashi! Makes me so happy you are loving this recipe! ? Holy Hedwig Harry! 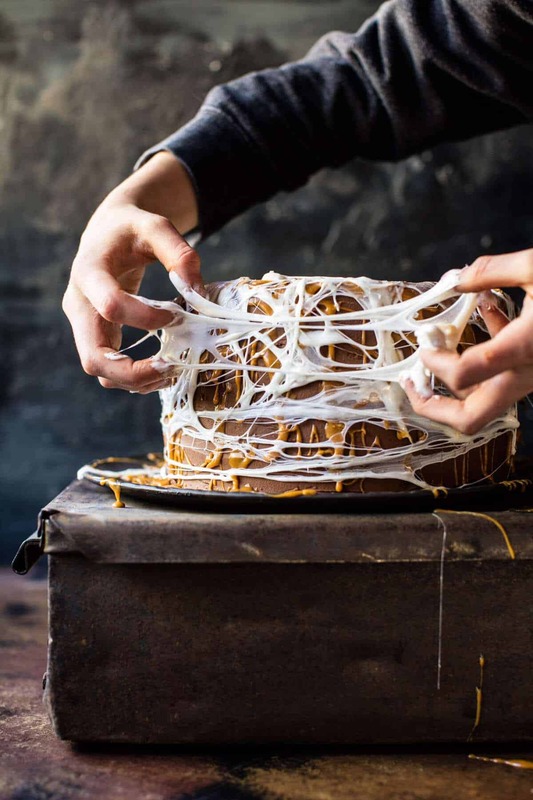 That is one insanely good looking cake and the marshmallow spider web? That right there, is an absolute stroke of GENIUS! It looks fantastic, major – like MAJOR – high fives from my corner of the internet to yours lady!! YAY!! So happy you love this Rebecca!! Thanks so much! and the spider web from marshmallows.. I mean.. genious. Another masterpiece!! I can’t wait to try this with the marshmallows- my son is going to love it!! Awesome to hear!! I hope you and your son love this when you try it!!? Thanks! Oh my goodness this cake looks SO beautiful and it’s so creative! Love how you’ve interpreted the Forbidden Forest theme! Awh thanks so much Rhian! So do I! Haha so happy you love this one, Aimee, Thanks! I love everything about this, and being a Harry Potter nut myself I totally get it! Haha yes!! Thanks so much Kathy! Tieghan. TIEGHAN. This is absolutely the most BEAUTIFUL, STUNNING cake I’ve ever seen. I’m also the biggest Harry Potter fan. Lucky are the people who get to share this cake with you! Haha thank you so much Jessica!! SO SO happy you love this cake and I hope you get a chance to make it!! The frosting instructions say to beat in the peanut butter with the butter and powdered sugar, and then in the next line to add in the cocoa, peanut butter and vanilla. Is it a double dose of PB? Did you ever get a reply on the amount of peanut butter to add in the frosting since it appears to suggest adding it in two separate steps? Hey Pam!! Thanks so much for pointing this out, it is actually NOT a double dose! I fixed it on the blog already. Let me know if you have any other questions! What an incredible cake! BRAVA!!! THANK YOU!! Happy you love this Rose! Wow! What a Halloween masterpiece Tieghan! That marshmallow spider web is so cool. And the butterbeer frosting sounds delicious. Well done! Yay! So happy you love this Mary Ann! Thank you so much! Omg, those layers!! And that butterbeer frosting!! Amazing. Really well done! I love the marshmallow spider web! OMG I have to make this for my 8 year old’s birthday next month! She would go bonkers for it. Awesome!! I hope she LOVES this and a happy birthday next month!? Thanks so much Sara! Haha yes so much fun! Thank you so much Ardith!! 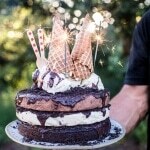 I love this over-the-top super fun cake! I just discovered your blog a couple weeks ago and you have endlessly impressed me. I get excited about EVERY SINGLE ONE of your recipes. However, this takes the cake (pun intended ;)). I can’t wait to see what other goodies you’ll have for fall! This is so awesome to hear Emily!! So happy you love all of my recipes so far and I hope you continue to love them!! Thanks! ? Wow and wow… Gorgeous, stunning, so much fun and so yummy!! Yes! Thanks so much Nicoletta! Haha right?! Only on this cake lol! Thanks so much Lili! Wow, Tieghan! I am dying over this cake! 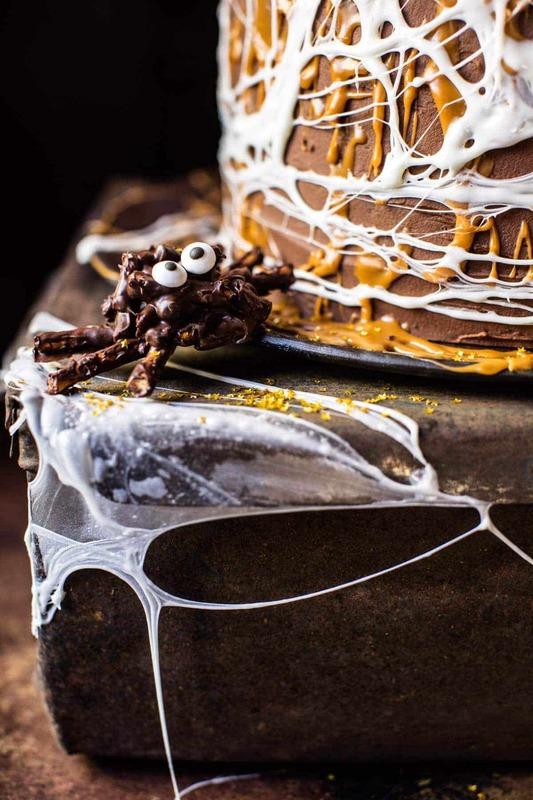 Every single bit of it, from the amazing marshmallow spiderweb to the chocolate forest and butterbeer frosting. I can not wait to see what else you have in store for us! Thank you Ramona!! SO happy you like this cake. ? Tieghan, this looks fabulous. I will be making this for my work’s Halloween party just to get their reaction! This looks like it’s so fun to make, not sure I would want to cut it! Thanks again for a great recipe and for sharing with all of us. I always follow your great blogs! 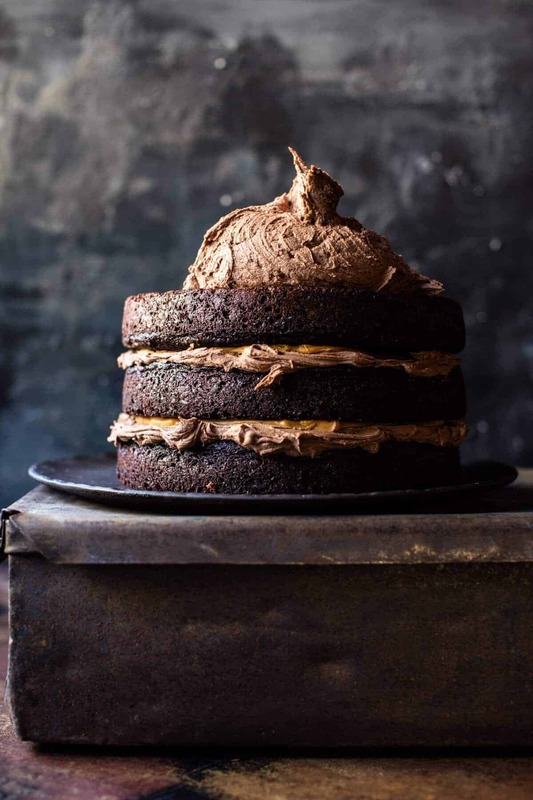 wow…just wow……..I can almost taste that moist chocolate cake right now. SO DELISH LOOKING Tieghan! Yes the butterbeer was super delish! But thank you so much Andrea! OMG!! That is an awesome cake!! This is AMAZING!!! I’m throwing my soon-to-be 8 year old a Harry Potter birthday and have been looking for ideas. I come to your website just to drool over your beautiful recipes, and I think I found the perfect inspiration! Wow that sounds like so much fun, and I am sure he will love his b-day party!! Thanks so much Kadija! I’d love to make this cake but unfortunately my son has a peanut allergy is there a substitute for the peanut butter in the icing? WTH?! This is the most amazing thing in the whole universe I’ve ever seen! No joke, this cake screams HP and Halloween. And those spiders? I can’t even..
Tieghan, you are amazing and I worship you as my cooking/baking Goddess. Ahh!! Thank you so much! This is so sweet and I am SO happy you are loving this cake! Amazing. Can you please write a cookbook of only Harry Potter themed recipes? Wouldn’t that be the best? This cake is my jam. Haha thank you so much Kate! YAAAASSSS! I love your quick and easy recipes, but over-the-top commit-a-whole-day recipes are what led me to your blog. This is one of the most amazing, make-me-NOW cakes I’ve seen all year! Yes!! SO glad you are loving my recipes! Thank you so much Christine! Oh my goodness what a perfect and fun looking cake! HP & Halloween obsessed? YES I AM! I would love to make this cake, but guaranteed I could not make it anywhere near as good looking as yours! Oh my I am sure yours would be just as great! Thank you so much Brooklyn! This cake is seriously epic!! I love the way you decorated it. The chocolate trees and spiderwebs and spiders. Yes, yes, YES!! Awh thank you so so much Sheila! I am so happy you are loving this cake so much, but I am sure your recipes and ideas are awesome, not lame, so go for them!! ? This cake is so so epic! This looks SOOOOO good! 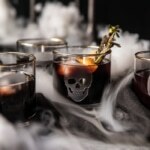 We’re having a Halloween party this year and this will definitely be on the menu! Love your creativity! Awh yay! I hope you and your guests love this! Thanks so much! Oh man, everything about this cake is awesome…except the fact that it would terrify Ron Weasley! 😉 Seriously though, love it! Thank you so much Emily!! But seriously, everything terrifies Ron lol! wow.. treat to the eyes.. loved the cake so much..
Hi! The background is just a black sheet, and candles. Let me know if you have other questions. Thanks! Seriously! This looks yummy as all heck. I just don’t think my 3 yr old will allow me time to be that intricate. omg YES. I have been to HP land like a bajillion times in the past month and THIS TAKES THE CAKE. Seriously, go talk to the people at Universal right now and see if you can get this cake in there!!! Bookmarking and definitely making at les HP-themed parties that are happening soon! Awh thank you so much Ala, this is so sweet! This sounds amazing! I am one of the biggest Harry Potter fans, so I absolutely love it! 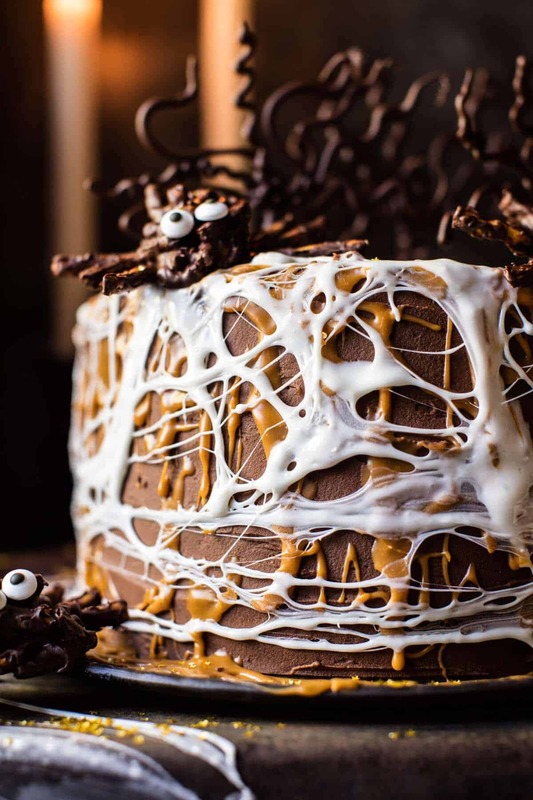 I’m having a Halloween party this weekend and was planning to make the Chocolate Bourbon Caramel Macaron Cake for it, but now I’m torn. Any thoughts on your preference between these two based on taste? Hey!!! 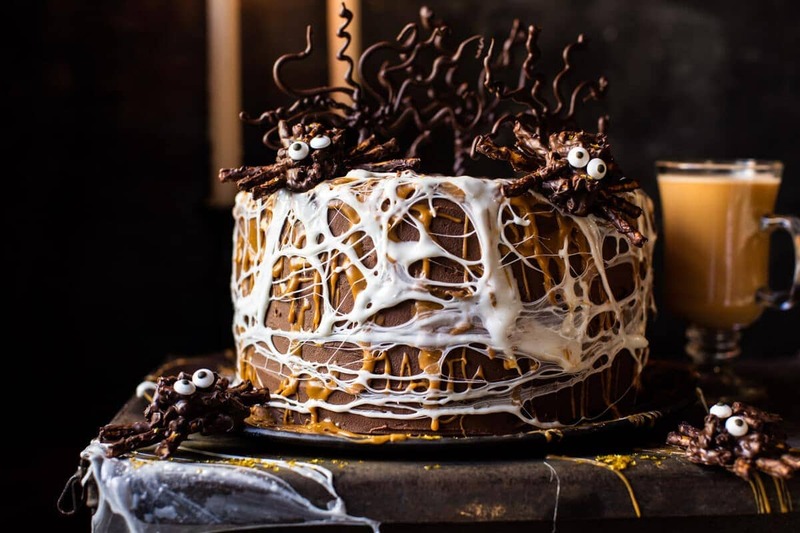 Honestly, both cakes are so great and I love them, BUT this cake is totally the cake for a Halloween party and it taste amazing! it is the best! 🙂 let me know if you have questions. Thank you! DYYIIINNGGG. Love Harry Potter and want all of this cake. Yay! So happy you are loving this! Thank you Marilyn! Oh my gosh this cake looks amazing! I want to try it out for my birthday but eggs are a no go, do you have any suggestions for a good substitute? Thanks for sharing the recipe! Hey Lauren! Thanks so much! Unfortunately, I am not comfortable giving you a sub fo eggs since I have not tested the recipe that way. That said, I do have a vegan chocolate cake you could use in this cakes place. Then just frost and decorate like this cake. Hope that helps! This was a fun to make with my grandchildren, although all of them opted for 8 eyes on the spiders. Can’t wait to see what else you have in store for Halloween Fun!! Thank you so much Wendy! I am so happy they loved it! Genius love your photos and your recipes .Thank you so much?? Haha thank you so so much! So happy you are loving this! Perfect, I hope you love it! Thank you Dana, you as well! This looks amazing! Around Halloween you sometimes see haunted gingerbread houses and the like, but I think this cake takes the win!!! Awh thank you Brooke! SO happy you love it! Oh my gosh! This cake looks and sounds amazing! My husband’s workplace has a Halloween Baking Contest every year, last year I made your Salted Caramel Apple Snickers Cake and won the grand prize! 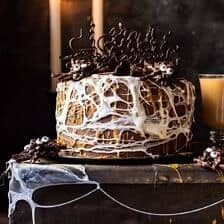 Just showed my husband this, we’re both drooling and thinking the Forbidden Forest Chocolate Butterbeer Cake is going to be this years entry. Ah! No luck needed, I think you will make it perfectly? I hope you win, and everyone enjoys it! Thank you Michele! So, I won! Thanks so much for your awesome recipe! I thought it was easy to follow and while time consuming, it was completely worth it! Even though my trees were kind of klunky, I’ll just have to make it again and practice my chocolate piping! My husband is a retired Navy Chief and works at Navy Recruiting District Portland, it was a silent auction and the bid was $100! So that and my prize money were donated to the Morale, Welfare and Recreation fund for the active duty sailors and families here in Portland. Oh my gosh, again?! Yes go you!! So happy you did, and I am sure your chocolate trees looked amazing! Even better is that the money is donated to a good cause! Thanks Michele. ? I was want to try and make this into cupcakes. How long would I bake them for? It looks absolutely glorious. This is THE perfect Halloween cake!! I’m dead. Making this for our Halloween party FOR SURE! YAY! I hope you love it! Thanks Paige! Wow! This looks amazing, and I am making it next weekend for my friends kids, who are obsessed with Harry Potter (I am too, so it’s not totally selfless). I was wondering if you have a suggestion on the timing of the baking and the decorating. Originally I was planning to bake the cake and decorate it all in a day, then refrigerate it until about an hour before it’s ready to be eaten. But then I questioned whether I should bake the cake and frost it the day before, refrigerate it overnight, then add the marshmallow web and other decorations the next day. Would this allow the frosting to set before adding the other decorations? Is it necessary/beneficial, or should I just do everything at once? Thank you! Hey John!! That is so nice of you and so fun! You can really do either or. The cake holds up well when assembled all at once, so if that is easiest for you, go for it! The only thing I will mention is the trees can be a little flimsy if they get too warm, so try and keep the cool. Let me know if you have ANY questions. Hope the cake is a it! I made the cake and it turned out great! Putting the marshmallow web on was so much fun lol. It looked awesome, my friends and their kids loved it, and it was delicious! Definitely a new Halloween tradition. Thank you! Ah yay! Sounds so fun!! So happy you liked it! Haha! Well I hope you love this one!! Happy Halloween!! Does the spider web technique works with Fluff ? Hey Berry, I am not sure, I have never tried that. Fluff might be a little too moist. Going to attempt this cake today! Do the buttermilk and yogurt need to be room temperature as well? Ok, no, sorry, this was a terrible cake for me. I’m a good baker, but man this has been hell. Maybe it’s because since I’m in Europe I had to make my own ginger beer and my own buttserscotch chips (because we don’t have them here) or maybe because I’m not used to use SO MUCH butter (again: european) or sugar. But it’s been a nightmare and I don’t even like the taste. Everything tastes like butter. Oh, and here I’m going to have a mini-rant: WHY DON’T YOU AMERICANS USE GRAMS INSTEAD OF CUPS????? A-M-A-Z-I-N-G!! Having a piece right now, actually and am going to have to finish it later because it just sooo much chocolate goodness in every bite! My daughter had a blast with the spider web! Okay, just another bite….wait for it…..yep, that’s the stuff. Only thing missing is a tall, cold glass of milk :), which I’m going to remedy right now. This cake was SO fun to make! The chocolate cake was amazing. The only thing I didn’t care for was the peanut butter in the frosting. I was really hoping for that “butter beer” butterscotch-y flavor and felt the peanut butter negated it. Easy fix though! Just leave it out! If the chocolate/PB combo is desired then 5 stars!! Hey Kirsty! I have never tried that, but I think it will be fine. Let me know if you have any questions. Thank you! 🙂 Hope you love the cake! Wowwie kazoowie! 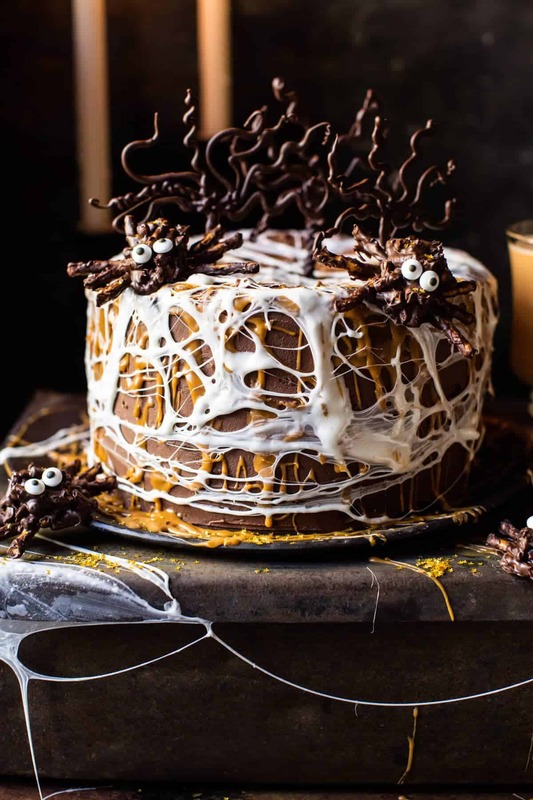 I can tell that you really put your heart and soul into this cake (would literally make sense since it is a Halloween recipe after all? :D)! Anyways, your hard work and talent shine in this delicacy naturally. I just want to take a HUUUUUGE slice and dig in. Bravo!! hey in the icing is the butter softened,melted or just they way it is right out of the fridge? Made this cake over the weekend and it was AMAZING. I was so impressed by how well the actual cake held up – will definitely be using your chocolate cake as my base moving forward! This is also the first time I’ve successfully made a buttercream-type frosting and I felt so accomplished – thanks for the fantastic recipe! 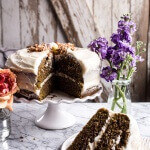 This cake looks amazing, I’m looking forward to baking it tonight! One quick question! In the recipe, it says “4 cups sticks butter” – could you clarify? I imagine it’s referring to sticks, but I thought I’d best check. Hi! I am so sorry for the confusion. You need 4 sticks butter. Recipe has been fixed! Hope you love the cake! My Daughter are having this cake at her party in a fortnight, and as I’m the one making it all I was wondering if the cake (only the chocolate part of course) could be made now and then store them in the freezer until Im ready to put the entire cake together? Hi Rikke! 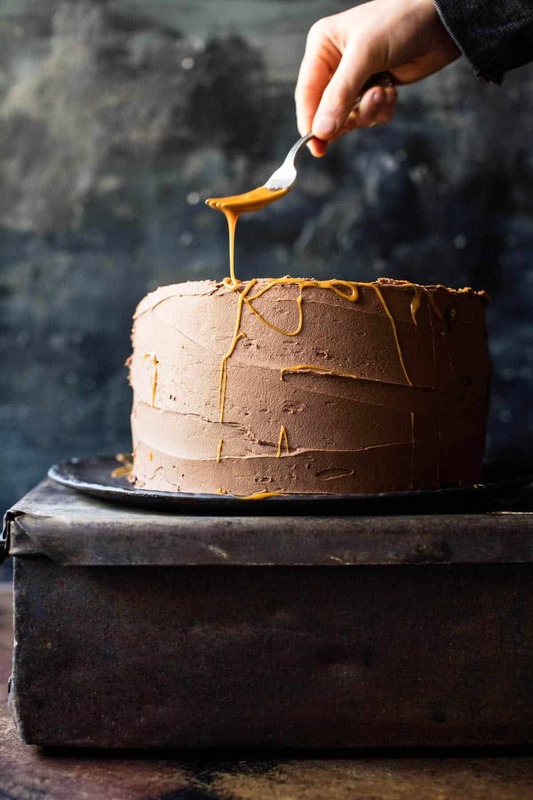 Yes, you can bake the cake and then freeze it. That works great! You can even frost it frozen and as you decorate it, it will thaw. Let me know if you have questions. Hope the cake is a huge hit! Hi there! This looks beautiful! For those who have made it, I’m wondering which flavor I should use in the cake… Ginger beer or cream soda? The flavors are so different and I’m wondering which one everyone thinks tastes better. I’m guessing that the cream soda makes it sweeter and the ginger beer more tiny, but I have not actually baked with either of those so I don’t know what the flavors translate to once they’re baked into something. Hi Kory! I personally like using ginger beer! This is my dream cake. I need to make it. Soon. Very soon. I will definitively send you a picture !!!! Yes! I can’t wait to see and I hope it turns out amazing for you Syrine! Thank you! I just made this for my dad’s birthday- as in this morning 🙂 It smells SO good and the frosting is to die for!! I didn’t do as many decorations, but I may later- we’ll see if the mood strikes 🙂 SO beautiful though! Thank you so much Laura! I am so glad you liked this! Hello! My family isn’t a huge fan of peanut butter. Would there be a good substitute I could use for the frosting? Maybe 1/2 of pumpkin purée? Or would something else be better? Thank you!